Lennox Industries, a leading provider of innovative home comfort solutions, has introduced the iComfort S30 smart thermostat, which makes saving energy and being comfortable easier than ever. By bringing innovation to energy savings through intuitive technology and adaptable features, the iComfort S30 helps homeowners save energy without thinking about it while having their homes feel just the way they want them to when they want them to. 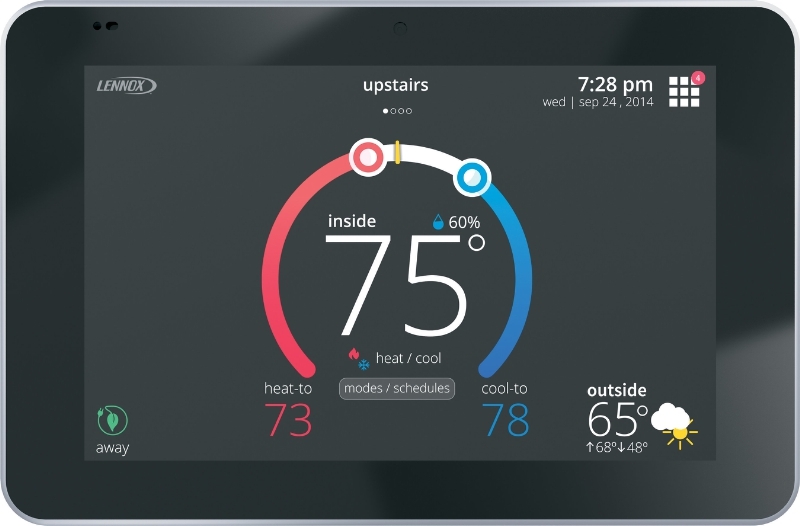 At the same time, the intuitive thermostat makes a heating and cooling system smart enough to alert them to a problem before it happens. Energy Savings: Using the GPS on your smartphone, the iComfort S30's Smart Away™ Mode can detect when the family is away and automatically set the thermostat to an energy-saving mode and return a home to the desired temperature when a family member starts returning home – adapting to a household's unique schedules. Comfort: The iComfort S30's "Feels Like™" Temperature, similar to a weather report, takes into account indoor and outdoor temperature and humidity to make a home feel exactly like the homeowner wants it to. For example, when the thermostat is set to 72 degrees, a home will "Feel Like" 72 degrees year-round. Healthy Air: The first-of-its-kind Allergen Defender on the iComfort S30 gives immediate allergy relief by monitoring air quality and pollen levels outside. When high levels of pollutants and allergens are detected, the fan automatically turns on to keep the home's air clean. Peace of Mind: The thermostat's advanced warning system predicts problems before they occur and alerts the homeowner's service company. "Your schedule may change, the weather may change and even the air quality where you live may change, but the iComfort S30 adapts to your life to give you comfort, savings and peace of mind," said Kyle Golden, energy efficiency expert at Lennox. "Today's families are busier than ever and Lennox is continuing to design products to simplify their lives, so homeowners can save money and be comfortable without thinking about it." The iComfort S30 is part of the Lennox Ultimate Comfort System, Lennox's most advanced and efficient heating and cooling products available on the market. To learn more about the iComfort S30 or to find a local dealer who can install the smart thermostat, consumers can visit www.lennox.com/locate/. 0 comments on "Lennox iComfort S30 Features First-of-Its-Kind Real-Time Air Quality Monitoring, Location-Based Functionality and Advanced Warnings"